Jigeum I Sungan continued his remarkable run of form and further boosted his claims to be the number-one Korean bred horse with victory in the Jeju Governor’s Cup at Seoul Race Park this afternoon. 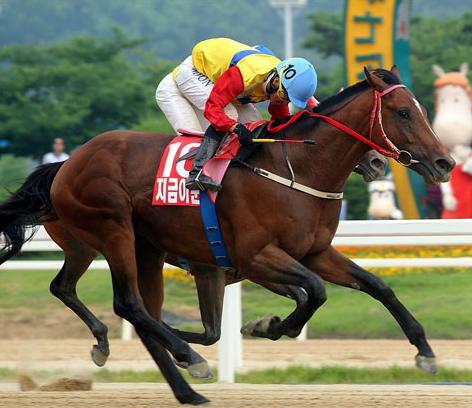 Jigeum I Sungan (Ingrandire) won two legs of the 2012 Korean Triple Crown and came into this race off the back of 5 successive wins since being beaten into 2nd place by Dangdae Bulpae in last year’s President’s Cup. Four horses came up from Busan to challenge him and, while they got closer than most have recently, when Jigeum I Sungan was asked for an effort, he didn’t disappoint. Having taken the lead a furlong and a half out, Jigeum I Sungan held off KNN Cup winning mare Yodongseong (Concept Win) and Road To Prince (Pico Central) to take victory by just over a length. There was none of the usual showboating from jockey Moon Se Young as they crossed the line as this win required a proper effort from Jigeum I Sungan. Instead he saved it until after the race, emulating Joe Fujii at the Grand Prix and Derby by bringing his horse back out in front of the grandstand to take the applause. Pushed as he was, this colt is still showing improvement every time he runs and, while it seems likely he will take Dangdae Bulpae’s crown of best Korean horse by default due to the 6 year-old’s injury, it was arguably only a matter of time until he did so on the track anyway. The less said about Seoul’s remaining entrants the better, suffice to say that the 4 visitors from the South filled places 2-5. Jigeum I Sungan is a superstar but he generally swims in a very small pond at Seoul. It was a great performance today and while it is a long way off, Jigeum I Sungan now looks the one to beat in the President’s Cup later this year. 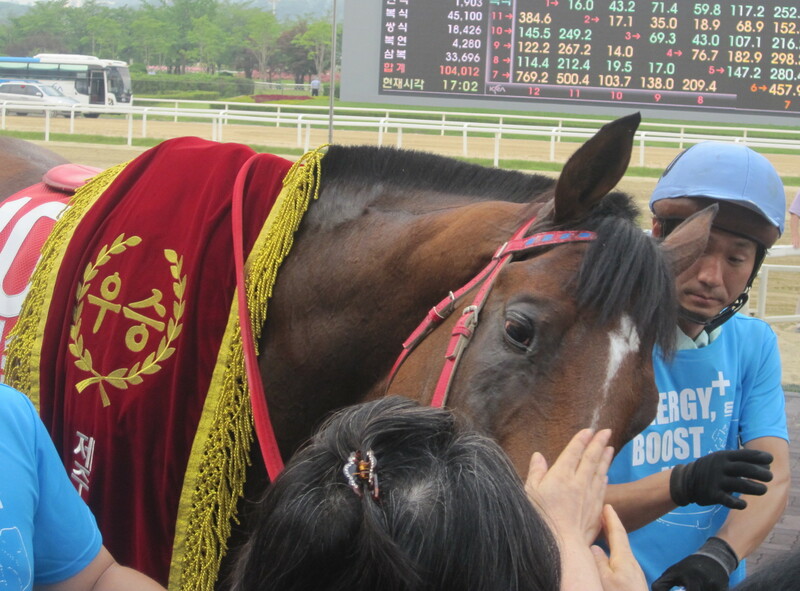 Jigeum I Sungan allows punters to pet him after he won the Jeju Cup. Try doing that with Tough Win or Dongbanui Gangja and they’d have eaten you. Next week, this year’s Korean Derby winner makes her first racecourse appearance since winning the Classic last month. Speedy First heads the field in a competitive looking Gyongnam Do-Min Ilbo Stakes at Busan. Sunday is Jeju Island Day at Seoul Racecourse! While to Gyongmaman, Jeju Island brings to mind images of rain, fog, and a “dormant” volcano (last eruption 1007) which shares the name of his favourite brand of Soju, to others it is known as the “Hawaii of Korea”. Of more interest to punters, however, is that Jeju is home to not only a unique type of pony racing which gets simulcasted to the mainland, but that it is also home to the majority of the Korean thoroughbred breeding industry. The KRA has decided to mark that this year by turning Seoul Racecourse into a “Mini Jeju” which will showcase Jeju culture (that Halla-san Soju, by any chance?) and its agricultural products. More importantly, they’ve decided to run a big-money race which has attracted some of the best domestic-bred horses from the capital and from Busan. He finished a shock 2nd to Jigeum I Sungan in the Owners’ Trophy in April prior to which he’d been marked down as a plodding handicapper. He followed it up with a creditable Class 1 3rd place, again behind Jigeum I Sungan. It would be quite a stretch for him to repeat that here though. Had his 2012 season wiped out by injury and his results since coming back suggest he is not the horse he was. An outsider. Difficult to believe that the 2012 KRA Cup Mile winner has won only 6 times. He’s only ever been out of the money once and almost always places. At minimum he should do that again. The 2011 Korean Oaks winner has been enjoying a renaissance since finishing a surprise 2nd in the Grand Prix Stakes last December and returned to Seoul to take the Ttukseom Cup in March. A disappointing 5th behind Yongduseong in last month’s KNN Cup at Busan, she seems to love the Seoul track and can’t be ruled out. The KNN Cup winner is on a run of 3 consecutive successes. However, she’s never won at further than a mile and is untried completely at this distance or on this track. She’s talented but those caveats are enough to suggest that stablemate Road To Prince is the real fancy from the Kim Young Kwan barn. A solid enough performer but he doesn’t win much at this level and he’ll not be winning here. A late bloomer but, barring a 5th place in the Busan Ilbo Cup in February, looks to be getting better with each run. 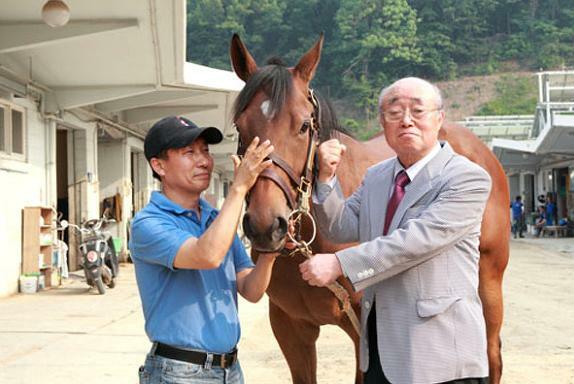 Jockey Joe Fujii and trainer Kim Young Kwan generally only come to Seoul to win and he will have plenty of backers. She hasn’t impressed since graduation to CLass 1 this Spring and there’s little recommend her here. Two wins over course and distance this year already means he can’t be discounted although he did get turned over in his two most recent outings by opposition inferior to what he’ll face here. Since winning the Korean Derby last May, he’s won 7 of his 9 starts and all 5 this year. He’s the best Korean horse running at Seoul at the moment (and with Dangdae Bulpae on the long-term injury list, perhaps in the country) and he still appears to be getting better with every run. If he runs anything close to his best, he wins. Hasn’t won since 2010. Won’t win here. Gets in because few want to take on Jigeum I Sungan and his owner likes a challenge. Almost a year to the day since she first arrived at Seoul Racecourse, Fly Top Queen is set to make her racing debut this Saturday. The filly became the most expensive racehorse every imported to Korea when owner Oh Ho Kuck paid $225,000 for her at the OBS Spring Sales in Florida last April. Horses don’t know how much money has changed hands for them though and Fly Top Queen has been injured ever since she arrived, suffering with lymphatic problems. She race-trialed once last year and qualified but never made it to race day while she was withdrawn from another trial this March. Early last month she had another go and comfortably won her heat. Now finally, she will line up in race 2 on Saturday, class 4 race for fillies over 1200 metres. She will be favourite. It is a big weekend for fillies at Seoul as on Sunday the track hosts its major Oaks trial, the Sports Seoul Cup. That only 9 fillies will take their chance suggests that Seoul owners are not exactly relishing the prospect of a trip down to Busan next month to face Derby winner Speedy First in the fillies’ Classic. There are some decent entrants though. Joy Lucky’s only defeat to date was in the Derby while Cheonnyeon Dongan was showing great promise before running into problems in the KRA Cup Mile. The useful looking Dewma and Jumbo Speed will also be there. Busan’s feature race is also on Sunday as prolific winners Dongteuja and Tamna Ace face each other over 2000 metres. Peter Wolsley is closing in on his 200th Korean winner as Ghost Whisper completed another great weekend for the Aussie trainer by winning the first of co-feature races at Busan today. Following on from his treble on Friday, Wolsley has now saddled 187 winners at the south-coast track. Ghost Whisper (Gotham City), a 5-year-old grey gelding who had an 8-month lay-off after collapsing with heat exhaustion at the end of last Year’s Busan Metropolitan Stakes, was sent off at little over 2/1 yet, such is Wolsley’s knack at getting his horses into races they can win or place in, he wasn’t even the stable’s first choice. 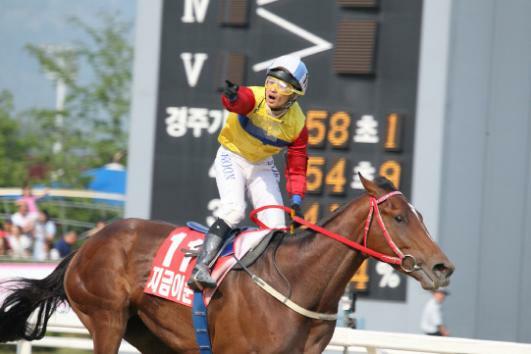 That was the even-money favourite Cheongchun Bulpae (Milwaukee Brew) who had retained jockey Jo Sung Gon on board. However, Darryll Holland is not a bad jockey to be able to call on to ride your second string and once he had Ghost Whisper in front at the top of the home straight, the result was never in doubt, the grey winning by a comfortable 2 lengths and Cheongchun Bulpae coming home in third. Ghost Whisper is owned and was bred by Jeju based Pegasus Stables. Under foreign management, Pegasus have been Wolsley’s keenest supporter since his arrival in Korea at the end of 2007 and it was their colt Rumor Has It (Lethal Instrument) that broke his maiden to give Wolsley his first of three winners on Friday. Filly Placid Angel (Menifee) and US import Long Way Baby (Werblin) completing the treble. Just as Pegasus have supported him, so Wolsley has supported the overseas jockeys who ride at Busan. Ghost Whisper was Darryll Holland’s 9th winner at the track and a great send-off for the British rider, who will pay a flying visit to Royal Ascot this week to partner Monseiur Chevalier who takes on Animal Kingdom in the Queen Anne Stakes on Tuesday. Wolsley’s win ratio is a solid 16% but his “show” ratio is a remarkable 41% – only Busan’s champion trainer Kim Young Kwan can boast a higher one. Ghost Whisper, decked out with the pacifiers that Wolsley introduced to Korean racing, was winning for the 9th time. Few would bet against his trainer finding another race for him to win soon. Up at Seoul, the feature race of the day was the MBN Cup and it was old-stager Green Empire (Bertolini) whi took the honours. The New Zealand bred 6-year-old has always been a solid campaigner but a very rare winner. Today, he closed quickly in the final furlong to beat pre-race favourite and last year’s winner Haedongcheonwang (West Acre) to take only his 3rd career win in 34 starts. Later at Seoul, former top-ranked Korean bred horse Ace Galloper (Chapel Royal) returned to action after a three-month absence. However, he found himself comfortably beaten by Singgeureounachim (Exploit) in a class 1 handicap over 1800 metres. Ace Galloper’s trainer Seo Beom Seok, who was not happy about his horse being forced to carry 61kg, will take up a trainer’s license in Macau. He’ll be hoping the handicapper there is a little more lenient. Stakes action returns to Seoul next week in the shape of the Sports Seoul Cup.